Two years ago, Antoine Azar was working at the mobile strategy company he founded and headed, Mobilogie Inc., when he saw a gap in what was available for marketers and retailers working for small businesses. And as an entrepreneur, he decided to do something to fill it. Today, Azar and his two co-founders launched their new startup, ThirdShelf Inc. The Montreal, Que.-based startup is looking to reach small to mid-sized businesses (SMBs) with less of a budget, yet the same marketing requirements as their large counterparts. ThirdShelf’s concept store at Dx3. From the time a consumer walks into a store, to when he or she makes a purchase, ThirdShelf aims to provide an end-to-end experience, Azar says. The company had its official launch today with a prototype of a completely mobile-infused store for one of its customers, vintage luxury goods retailer LXR & Co. 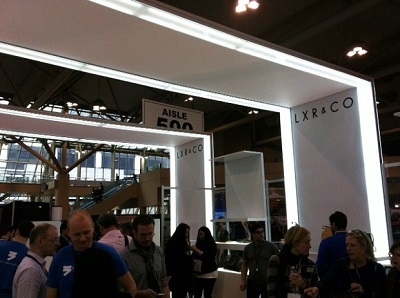 It displayed the concept at Dx3, a conference for digital marketers and retailers held in Toronto this week. ThirdShelf offers a proprietary mobile app and back-end web platform, storing customer data in its cloud. Its technology allows retailers to constantly interact with consumers as they move through their stores. First, consumers have to download the brand’s app, signing in with either an email address or a social media account like Facebook, giving marketers valuable data on their locations, likes, and so on. When consumers reach a store location, they can open the app and then be remembered for their past purchasing history and the loyalty points they’ve racked up. Then, as they get deeper into the store, walking by some of the store’s tablets, they will automatically get notifications about what’s on promotion, and what’s on the store’s shelves through Apple Inc.’s iBeacon technology. Consumers can also tap the tablets to get more information on the products displayed – and for SMBs that don’t have enough floor space to display all of their products, customers can see what else is available simply by scrolling through the tablet’s screens. For the store’s part, store employees will get a notification once a customer using the app comes in. That way, employees can provide better, more tailored customer service as they’ll know what this particular customer is looking for, based on past buying history. Retailers can also send targeted, segmented ads to their customers – for example, a brand might want to send a promotion to women between the ages of 21 and 35 who live in a particular city. And to offer the full end-to-end experience, ThirdShelf is partnering with a slew of other companies to deliver services to retailers. 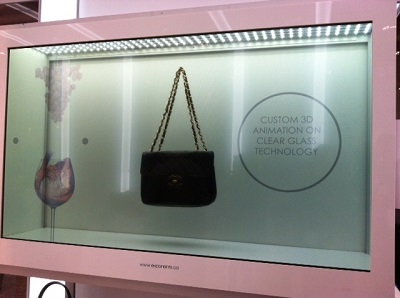 3D glass screen by Exponents, one of ThirdShelf’s partners. Displayed at Dx3. For example, it’s working with LightSpeed Retail Inc. to provide point-of-sales software, and for a real showstopper, it has teamed up with Exponents Canada to bring glass screens into brick and mortar stores. Stores can install these screens in front of their products, augmenting their appearance by overlaying them with moving animations – no projections or extra lights necessary. “When you look right now, there’s a lot of noise about oh, e-commerce is killing brick and mortar … If you think about it, before the e-commerce, the reason you had a store was to hold inventory. It’s like a mini-warehouse,” Azar says. He adds he feels brick and mortar stores still account for more sales than e-commerce – and that these stores will always provide a unique experience. Right now, ThirdShelf is working with 15 retailers as part of its beta phase, but it’s now looking to expand and bring more businesses on board, Azar says. The company is still deciding on how it wants to price its services, but it will be basing its prices on a monthly fee.